Thirty years on, Mallorca still has everything going for it for a family holiday: about as short a flight as you can get to the Med (2 hours from Gatwick); just one hour time difference; good weather pretty much guaranteed between May and September; beautiful beaches; gorgeous scenery; plenty of attractions (caves, castles, water parks, museums, craft factories…); and an abundance of accommodation to suit all tastes, from basic apartments to seriously deluxe villas and 5 star hotels. 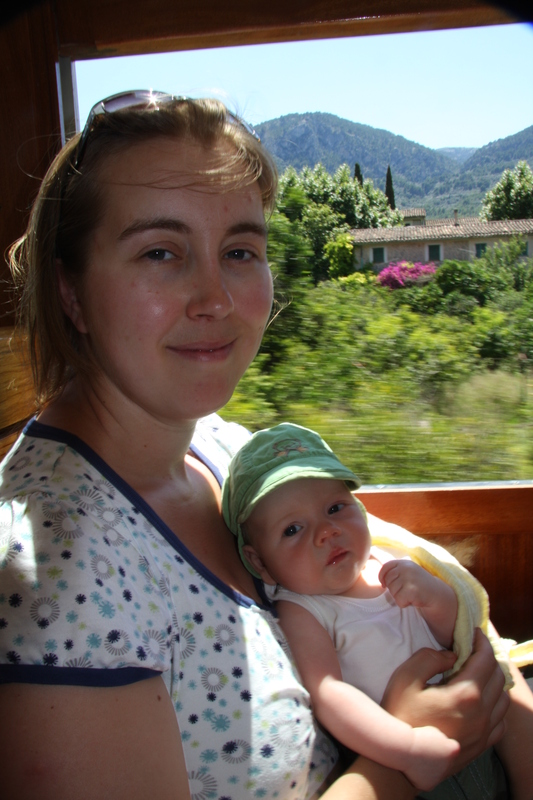 For all these reasons, we decided to make Mallorca the destination for our first family holiday, when Leo, our son, was just 10 weeks old. 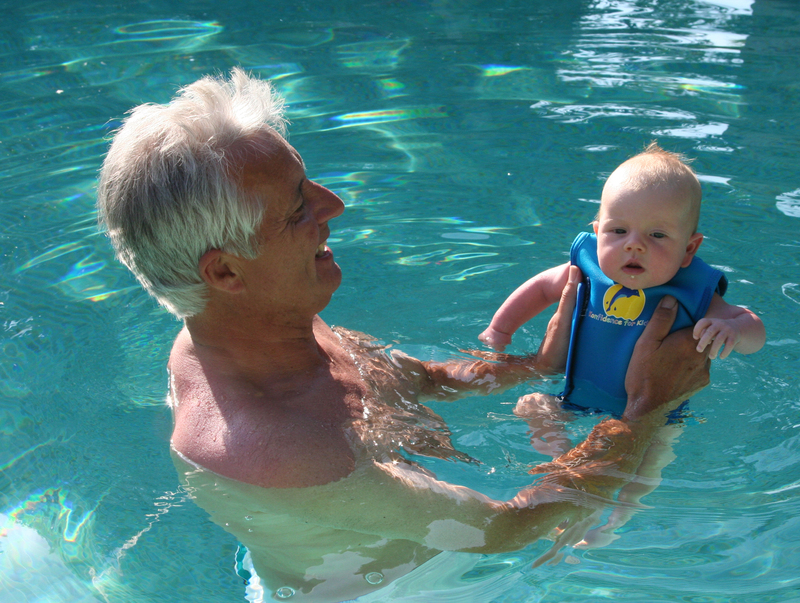 I actually had it booked several months before he was born – like it or not, our baby was going on holiday! We decided to go for two weeks and, anticipating the need for a little ‘assistance’, invited the grandparents to come along too – 5 days each, with a weekend in between for us to fend for ourselves. We decided to book a villa. We wanted to self-cater and we were seeking privacy – we didn’t want to feel conspicuous should Leo start screaming or being sick. 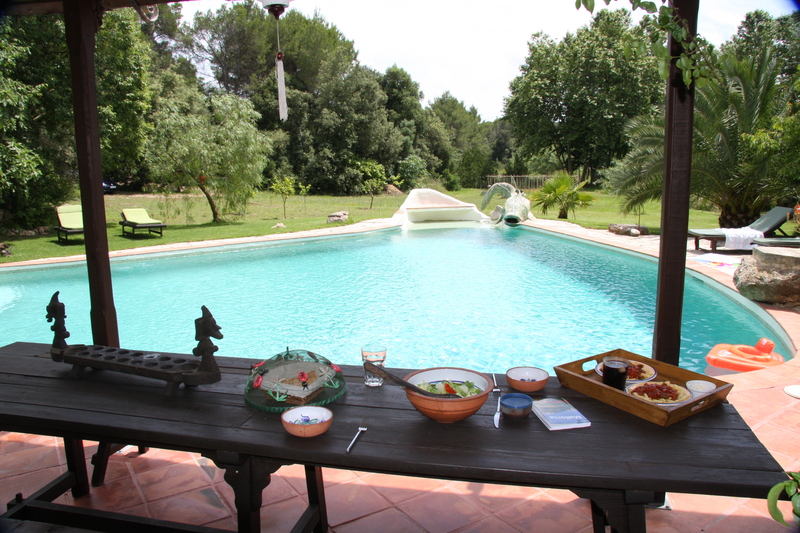 We also wanted plenty of space for everyone (no wheelie-bed in the lounge for Mum this time), and a nice pool. Where we stayed, Villa Casa Rosa, near the village of Capdepera in the North-East of the island, definitely ticked those boxes. Featured in Homes and Gardens magazine, it is beautiful with wonderful outside terraces, gardens to roam around in and a pool that was more like a lagoon. The owners are also on hand as well to help with anything and even offered to babysit. However, were I to do it all again, I’m not sure I would have chosen this particular property. It was fairly remote, down a dirt track with no shops or restaurants in walking distance, which meant we couldn’t easily go out and eat. Getting in and out of the car all the time – and not being able to have a drink – got a bit tedious after a while. My advice would be to look for somewhere less isolated, ideally a short walk from the sea. 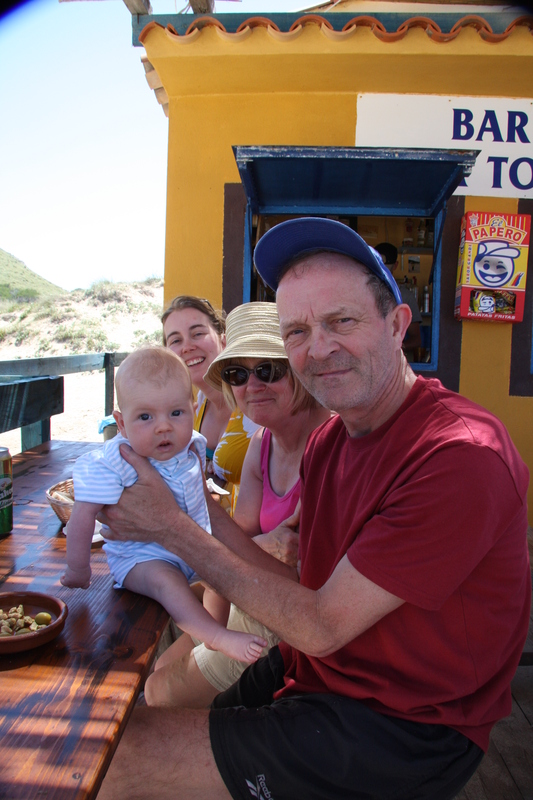 And if I wasn’t with grandparents, I’d probably avoid villas altogether and stay somewhere more sociable that’s geared up for babies and toddlers – like Hotel Migjorn near Colonia San Jordi. Cala Torta. Not for anyone wanting rows of sunloungers or jetskis, but this was our favourite. 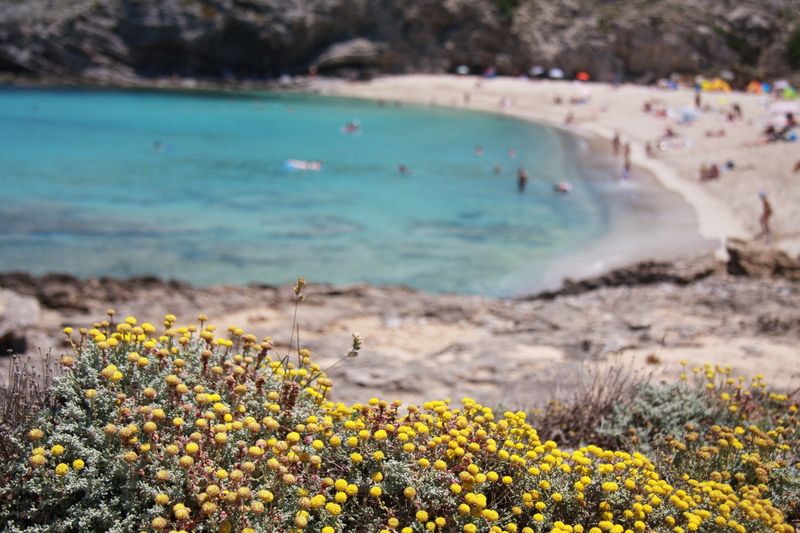 Accessed by a dirt track and completely undeveloped, Cala Torta is a perfect crescent of golden sand and brilliantly blue water. On our first visit, thick seaweed had congregated along the shore, making paddling somewhat unpleasant, but this disappeared on subsequent visits. There’s free parking in the pine groves behind the dunes and it’s short trek to the beach itself. Best of all, in the summer season a little chiringuito sets up on the beach, serving deliciously fresh fish on a shaded terrace (beware – it’s not cheap, but fish in the Med isn’t). Wonderful. Cala Mesquida. Another stunning beach, but more developed with a small resort on the Western side, sun beds/pedalos for hire and access via a paved road. There are a few beach restaurants and cafes to choose from – nothing remarkable but they do the job. The day we went, the shore was thick with seaweed, but I’m sure this is not a permanent thing. Canyamel. This was the nearest beach to our villa and, whilst not as ‘special’ as Cala Torta, was perfectly fine for a few hours. Backed by an unassuming collection of apartment buildings and hotels, access is easy (you can park on the road right behind the beach) and there are places to buy ice creams and rent sunbeds. Cala Agulla. 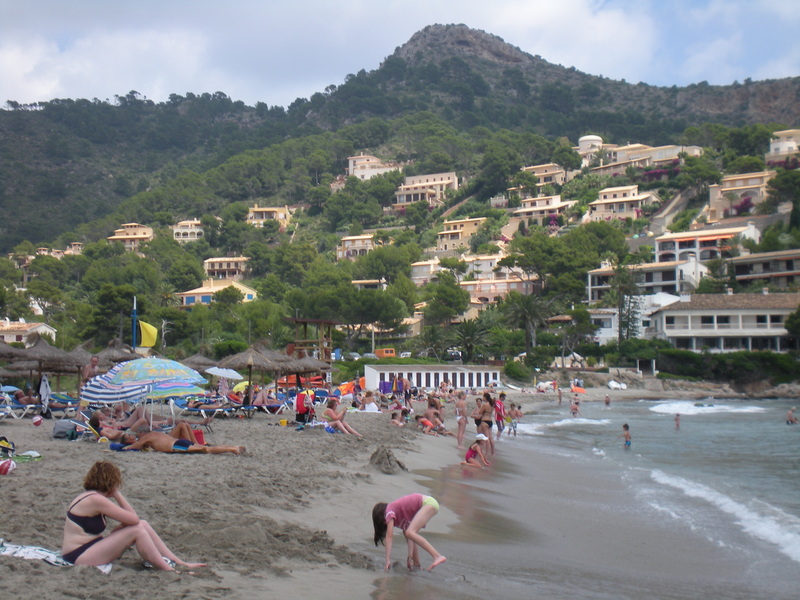 A lovely beach backed by pine forest but easily accessed on foot from the resort of Cala Ratjada. Soller. A great place to head for that will get you up in the majestic Tramuntana Mountains. The best thing about Soller is the little tram that trundles down through the orange groves to the Port below. It’s a fun way to spend a couple of hours and great for babies and kids alike. Back in Soller, make sure you save room for the delicious ice cream sundaes with orange syrup. Formentor. 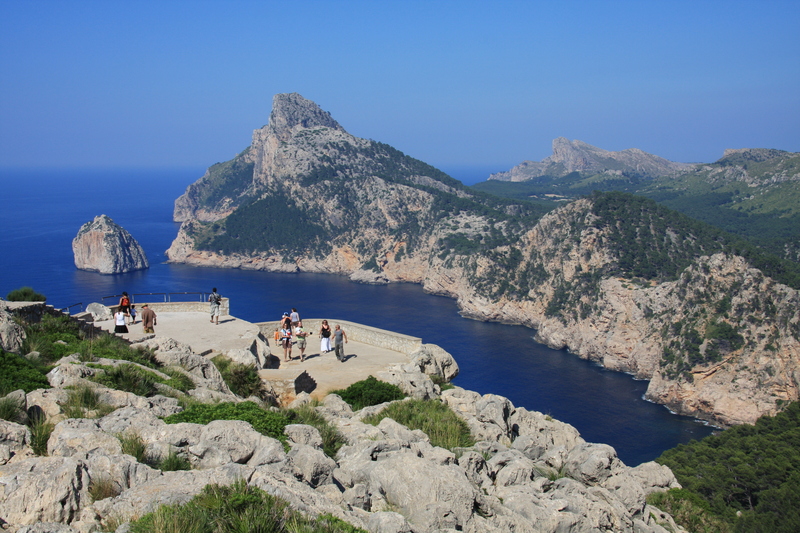 Well worth the drive, Cap Formentor is one of the great sights of the Mediterranean. Spectacularly beautiful with plenty of places to park up and soak up the views of the pine-clad mountains, white cliffs and gorgeously blue sea far below. It’s well worth stopping off at Cala Formentor – one of my favourite beaches in the whole world. A sandy strip backed by pines and the five star Hotel Formentor, the sea is unbelievably placid and perfect for paddling. We went in the evening and enjoyed a gin and tonic on the bougainvilea-clad terrace of the Hotel. Perfect. Cala Ratjada. Popular with Germans with very few Brits about (Mallorca seems to segment its resorts along national identity lines), Cala Ratjada enjoys a picturesque setting straddling sandy coves around a headland. It has a lovely promenade that is perfect for an evening stroll – we did it twice, once with and once without Leo. We never ate here but there are plenty of restaurants and bars along the way to stop, although you are more likely to get bratwurst than you are chorizo. Oh, and there’s a Lidl in the town to stock up on your Riesling on the way home. Arta. A nice town with a market on Tuesdays and Saturdays that’s a pleasant way to while away an hour or two and buggy-friendly. 1. Flights. 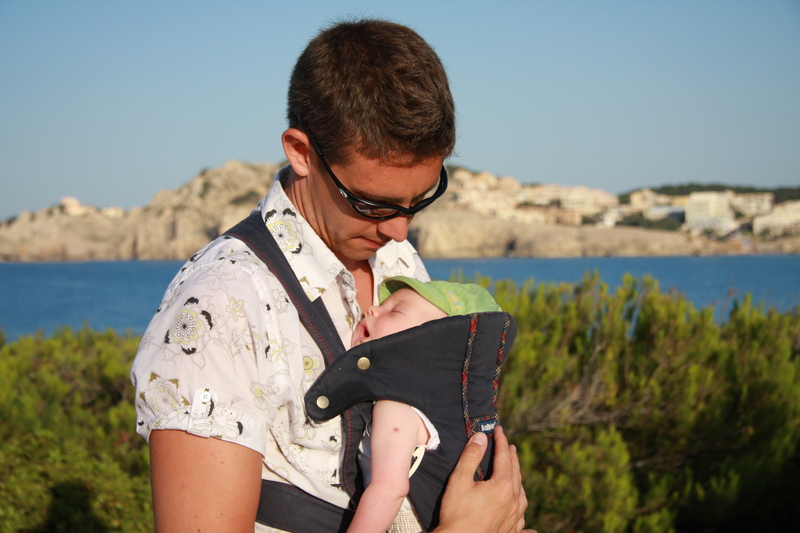 The great thing about Mallorca is that there is a huge choice of flights, meaning you can fly at a time that suits you and your baby. So if you don’t want a 5am start, you’ll probably be able to avoid it. 2. 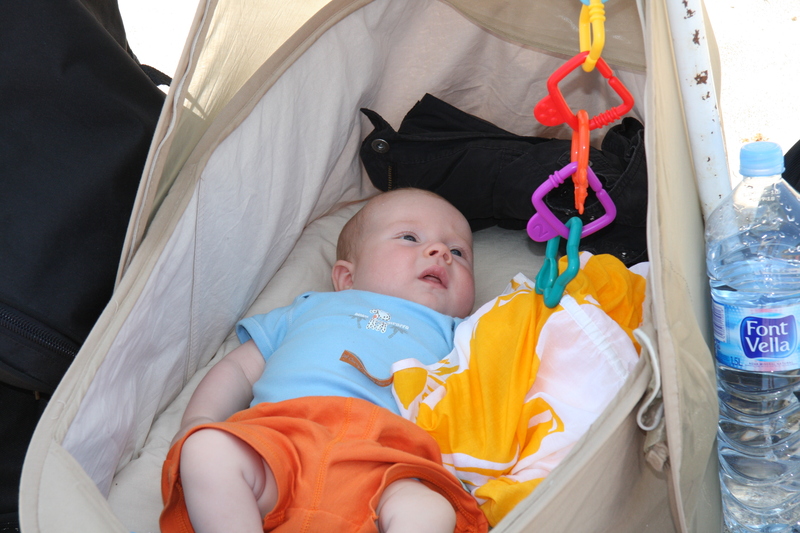 UV pop-up travel cot. I’d highly recommend taking of these – they are great for the beach. Your baby will be safe from the sun, it keeps them out of the sand and it’s somewhere for them to nap whilst you enjoy the sun. If you can’t borrow one like we did, they cost about £40 and can really make a huge difference to your holiday. Worth every penny. 3. Take your own car seat. It avoids the stress when you arrive at Palma airport of getting one from the car hire company. The last thing you need to worry about is how to fit an unfamiliar seat – or worse, being unsure whether the one they’ve given you is appropriate (they often don’t have the Stage 0+ car seats). 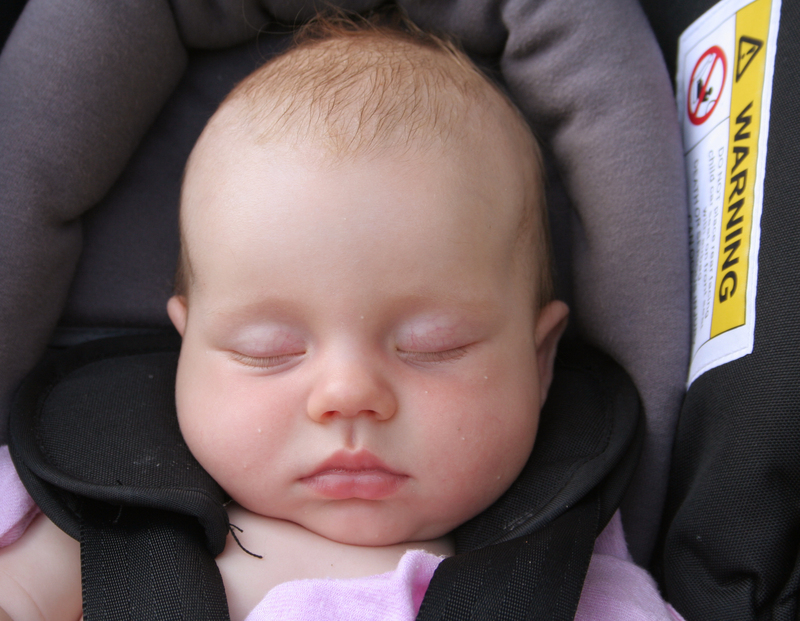 Plus, even if you don’t have a hire car, the car seat is really useful for putting your baby in by the pool and rocking him or her to sleep! This entry was posted in Destination guides, Europe and tagged beaches, Cala Ratjada holidays, Mallorca family holidays, Mallorca holidays, Mallorca with kids. Bookmark the permalink.